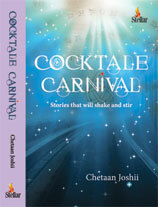 Cocktale Carnival is a celebration of stories to tickle your literary bone. Chetaan Joshii offers a scrumptious feast, where you are bound to experience the entire gamut of emotions...from amusement to intrigue, from pathos to arousal to surprise... An order, fairly unpredictable! Critical acclaim for Chetan Joshi’s scintillating short stories, Blind Man’s Buff: Original ideas, diverse themes, vivid descriptions, compelling plots! What more could one want? Chetan Joshi is a great story-teller.